If you say Hair Extensions to me, I used to automatically think of limp rat tails, Geordie Shore and Barbie hair. Say Hair Extensions to me now and I think.. HOT HAIR! 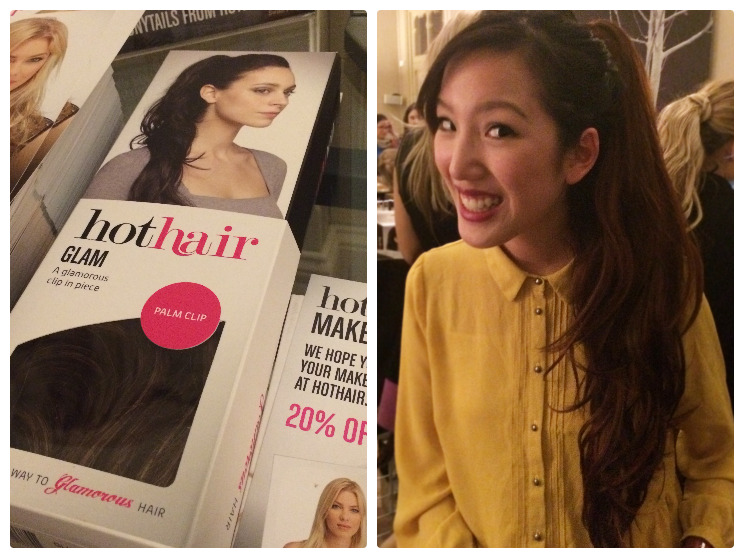 eye-opening event I went to last week, hosted by HotHair.co.uk. I got to try on fake ponytails, clip on buns, volumisers and even a full-on wig and what can I say? I think I’m a hair piece convert. The thing is, it all actually looked surprisingly good! Or maybe it’s just me – read on, take a look and let me know what you think! the hair pieces – that’s when the REAL fun started! Hair extensions are not all about the length either. Charli tried this decorative bun, which makes updo’s super easy – it all looks like her real hair right?! If you’ve already got quite long hair, try on some volumising pieces like this UpLift Crown Piece which clips in at the top of your head to give you some serious oomph – as modelled here on Katy! The placement of the Uplift piece will also give you additional height and width at the top of your hair – which makes makes a noticeable difference, especially when wearing a low pony. You can also adjust the curve of the Uplift to become anything from a boosting bump, up to a full-on beehive. Here’s another picture – partly to show you where the piece sits in your hair, but also partly for LOLS. I also got to try this beautiful Lavish Pony (only £35! ), which made me feel sooo totes Ariana Grande. It wasn’t even that heavy, it was so comfortable to wear, I started to understand why people wear these things day-in-day-out. get this Lavish Pony in my colour!! A piece like this would be an amazing addition to a minimalist outfit – I love it! I also won an awesome prize from LiLash – creator of ‘the world’s most popular purified eyelash serum’ – which contains a lash serum and also their brow enhancing serum – cannot WAIT to try it. My brows are easy to shape but they’re quite sparse, need me some brow boost! Can’t wait to try and tell you about it! ultimate blend-ability, and if you get the right shade it looks incredible. With thanks to Michelle from TSNC and HotHair for a great night. Can’t wait to experiment with my new hurrrr! What’s your favourite piece? Do you wear hair extensions? Tweet me your thoughts @FaceValueBlog or send me a comment on Facebook! Previous Post Money Monday: London Flat Buying Adventures Continue!